The holidays are a special time of the year for spending with family and sharing fond memories (or, perhaps more likely, fighting about politics and overeating). In any case, it is a time when, like Ebenezer Scrooge, people look to the past. So let’s look back four decades at a nice but brief holiday tradition from Marvel Comics: the Giant Superhero Holiday Grab-Bag. The Giant Superhero Holiday Grab-Bag was one of the company’s endeavors into large-size comic books, usually called “Marvel Treasury Editions.” These oversize 10” x 14” books were often sold at department stores, hobby stores, and some books stores during the 1970’s. As this period was prior to widespread direct market distribution (i.e. dedicated comic stores), it could be difficult to find these. Also, the $1.50 price was quite large compared to regular $0.25 comic books (the $1.50 price would be over $7 today, adjusted for inflation). However, they were mostly successful, and there were 28 Marvel Treasury Editions – as well as licensed editions featuring Star Wars and other properties – published from until they stopped in 1981. You can still find some (at varying conditions and prices) at comic conventions and on Ebay. Like most of the Marvel Treasury Editions, the Giant Superhero Holiday Grab-Bag was an anthology edition of previously-printed stories. 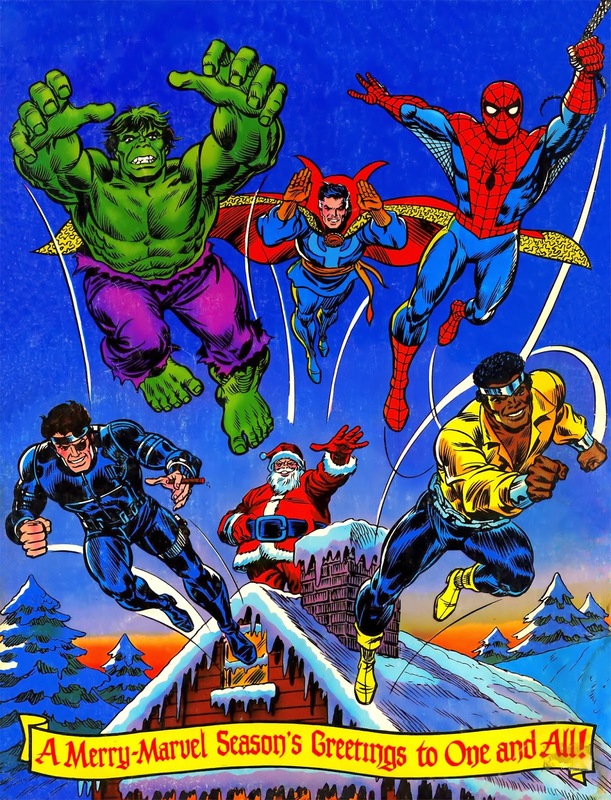 In some cases, the issues covered in the Giant Superhero Holiday Grab-Bag were holiday/winter-themed, though often not. What is perhaps most fondly remembered about the Giant Superhero Holiday Grab-Bag books was their sweet, seasonal covers. 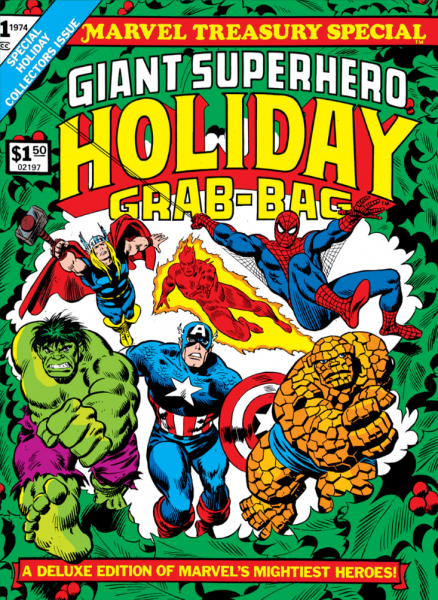 The first Giant Superhero Holiday Grab-Bag was published in 1974 and features a cover from John Buscema. There are five stories in the book, with the most enduring one being “Have Yourself a Sandman Little Christmas!,” a holiday themed-story from Marvel Team-Up in which Spider-Man and Human Torch encounter Sandman but decide to let him go so he can visit his ill mother. The other story of note is from Daredevil #7, during which Matt Murdock fights Namor, the Sub-Mariner. Other stories feature Black Widow and a Fantastic Four-Avengers team-up (with Jack Kirby art) against the Hulk (from Fantastic Four #25 and 26). The second Giant Superhero Holiday Grab-Bag came out for the 1975 holidays and features an amusing cover by John Romita showing Dr. Strange, Spider-Man, Luke Cage, and Nick Fury decorating a Christmas tree while the Hulk, dressed like Santa, listens to a little girl read her wish list! As expected, the stories inside feature those heroes, though really only the Nick Fury (from Nick Fury, Agent of S.H.I.E.L.D. #10) and the Luke Cage (Luke Cage, Hero for Hire #7 – with the awesome title “Jingle Bombs”) stories have holiday elements. The back cover has a different illustration of the five heroes from the front cover. The final Giant Superhero Holiday Grab-Bag from Marvel came in 1976. It features another great holiday cover that is actually wraps around. Gil Kane illustrated the cover, featuring Spider-Man, Hulk, Iron Man, and Thor flying through the air while The Thing rides in a sleigh dressed like Santa (a somewhat strange choice considering Ben Grimm is Jewish but still fun). Continuing on the back is the other half of the picture, showing other Avengers of the time – Captain America, Vision, Black Panther, Wasp, and Giant Man – as well as Silver Surfer. The ’76 Giant Superhero Holiday Grab-Bag contains five previously published stories: Marvel Team-Up #6 (with Spider-Man and the Thing), Avengers #58, Tales to Astonish #93 (with the Hulk and Silver Surfer), and Daredevil #86. There was also an original holiday framing story featuring the Avengers and Fantastic Four, written by longtime Avengers writer Roger Stern and illustrated by George Tuska and Don Perlin. Although most of the stories reprinted are not holiday-specific, they are overall strong stories. Marvel Comics still occasionally publishes holiday-themed issues and still publishes anthology collections. However, in spite of the fact that most of the material in the three Giant Superhero Holiday Grab-Bag books had already been published, the books are nice collections, due to their size, selection of stories, and festive covers. Comic books have changed in many positive ways since the 1970’s, but I think something like the Giant Superhero Holiday Grab-Bag, if it possessed some of the fun spirit of the holidays, would still be welcome in the comic book world of today.